People who use Excel frequently often boast about how powerful this spreadsheet software truly is. Yet most people wouldn’t know where to locate the Autosum feature let along Boolean logic, Pivot Tables and nested logic. 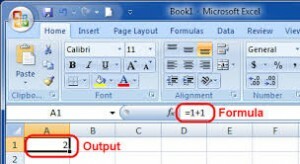 This is the very first function that people must learn in Excel. Let’s say you want to add two numbers. Type in =SUM and within the brackets select the cells or the range that you wish to find the sum of. Just as the function says it will, it finds the average of a given range. Let’s say you want to find the average from cells A11 to A35, then you have to enter =AVERAGE(A11:A35) in order to do so. It’s really as simple as that. Use Control+Click to highlight individual cells or drag-and-drop using your mouse cursor. If you want to find the largest number within a range of cells, all you have to do is enter =MAX(A7:A32) and it will find the maximum number in that range. Apart from this, if you want to find the minimum number within a range of cells, the use the MIN() function. You don’t have to manually count how many number are there within a range. Just use the COUNT function (=count(A1:A20)to find out how many there are. Alternatively, you can use the COUNTA function to find out the number of symbols, text and numbers within a given range.